This is another sneak peek of one of the newest sets that will be released tonight from My Favorite Things - Be Mine is the mini of the month. I love this box of chocolates - I colored the chocolate box with my Prismacolor Pencils and Gamsol and used my copic markers to color the chocolates - then went over the chocolate with my glaze pen. I used the "starburst" stamp from MFT's Icing on the Cake for the background on the larger and the smaller panels. I LOVE this color combo - I guess I should use it more often! Don't forget to head on over to the MFT New Release Cocktail Party tonight! It's from 9-11 EASTERN time in the MFT Member Forum. There will be sneak peeks, lots of fun and a chance to become MFT’s next Guest Designer. Head over to the MFT forum for more details! What a great card, love that color combo and the double bow, fantastic. I love the colors and the ribbon. Looks great! Ewwww.....LOVE the colour combo, Kendra and that ribbon is to die for!!! Awesome! Ooops!! I think you have the time wrong in your posting there, girlie!! It's 9-11EST not 7-9!! You'd a been early to the party!! Love the funky color combo. Works perfectly with the image. And that yummy ribbon sets everything off so well. Scrumptious! Really like this color combination and you are really twisting my arm regarding these new sets !! WOW! This card really pops right out atcha. Lovely! This is really a cute card. I love the color combo too, and I love your polka (You don't want to know how many tries it took me to type polka) dot grosgrain. Do you know where you got it? Great card as always -- your chocolates look good enough to eat! OMG, that is SO cute! That polka dot ribbon looks awesome on there! LOVe these rich colors, Kendra! Just fabulous! Gorgeous rich colors here! Love the layout and that bow is just fabulously done! Love it! 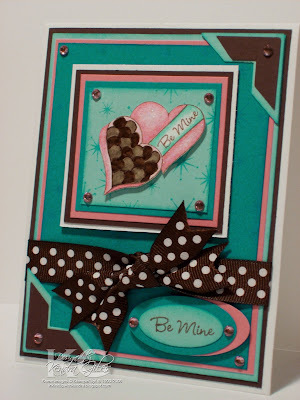 I love the colors you chose for this card, just georgous! Wow, what a great color combo. Love the card. So pretty! I love love love this card! Oooh I love the colors on this card! And that ribbon is fabulous! !